Arctic sea ice continues to suffer long-term declines — and many scientists are concerned with the future that will see no ice cover during the warmest months. Ice-free summers could help accelerate climate change in the rapidly warming Arctic, scientists say, and have profound consequences on the region's delicate ecosystem, from algae to polar bears. sea ​​ice to keep tabs on how to respond to climate change. This week, new research again raised concerns about melting ice – and its effects on the Arctic ecology. known as the Transpolar Drift Stream, a current that carries newly formed sea ice from the shallow waters near the Russian shoreline deep into the central Arctic. This is an important regulator in the ocean's biology and chemistry. 990s, at least half the new ice formed at the ocean's edges survived long enough to travel across the Arctic Ocean. But today, the new research finds, only about 20% of it lasts that long; the rest melts before it can complete the journey. The study suggests that the survival probability of first-year ice originating in the Russian shallows has dropped by about 15% each decade. "What is witnessing is a major transport current faltering, which is bringing the world one major step closer to a sea ice free summer in the Arctic," lead study author Thomas Krumpen, from the Alfred Wegener Institute for Polar and Marine Research, said in a statement. Declines in Arctic sea are a big concern for the climate. As sea ice disappears, it exposes more and more of the ocean's surface to the sun, allowing the water to soak up more heat. Many researchers have suggested that this process can contribute to a vicious feedback cycle, at which more ocean heat causes even more sea ice to melt. But the new research points to another concern, as well. If less is getting transported from the shallows into the central Arctic, then that means the deeper waters are probably receiving less of the nutrients and organic material the young ice typically carries with it. The consequences are still unclear, but it could cause significant changes in the types of bacteria and algae that grow in the central Arctic, the researchers note. Thinner sea ice, containing fewer sediments, may also allow more light to penetrate through to The water below, potentially changing the timing of algal blooms in the central Arctic. More monitoring is needed to determine what these changes might mean for the Arctic ecology. 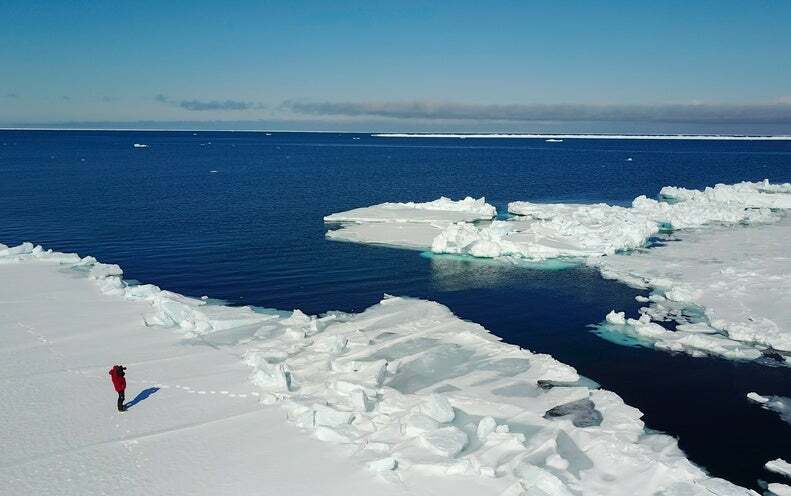 But researchers are increasingly suggesting that sea ice sheets are likely to have major implications for the polar ecosystem and its wildlife, even if the exact outcomes remain unknown. reached its annual maximum extent for the winter, according to the National Snow and Ice Data Center. Reaching 5.71 million square miles on March 15, the highest maximum since 2014 – but still for seventh lowest in the entire 40-year record. The four lowest maximum extents have all occurred between 2015 and 2018. Reprinted from ClimateWire with permission from E&E News. E&E provides daily coverage of essential energy and environmental news at www.eenews.net.